In 1750, Thomas Kean and Walter Murray opened one of the first theatres in New York City on Nassau Street. It was large enough to hold 280 patrons and the actors performed Shakespearian plays and operatic theater. The Beggar's Opera by John Gay was one of the most popular ballad operas during this time period. Theater stopped in New York during the Revolutionary War but began again in 1798 when the Park Theater was built. After the success of the 2,000-seat Park Theater, the Bowery Theater was built in 1826. More theaters arose in response to this success and one of the premier nightspots in New York was Niblo's Garden, a theater located at Prince and Broadway. The Black Crook (1866) is considered to be one of the first musicals. It was five and a half hours long and ran for 474 performances, which was a record for this time period. In the 1850s, the heart of Broadway Theater was located in Union Square and did not arrive to Times Square until the early 1900s. Theater owners were seeking out less expensive real estate prices and that is what led them to midtown at that time. In 1919, standard contracts were required for all professional productions as stated by the Actors equity Association. The 1920's sparked a new age of American Playwrights when John O'Neill wrote plays such as: Beyond the Horizon, Anna Christie, The Hairy Ape, Strange Interlude and Mourning Becomes Electra. He demonstrated that there is a place for drama in Broadway and paved the road for many drama writers that followed including Elmer Rice, Maxwell Anderson, Robert E. Sherwood, Tennessee Williams, and Arthur Miller, as well as writers of comedy like George S. Kaufman and Moss Hart. Classical revivals were also popular at this time. Shows like Othello and Romeo and Juliet did well with a booming economy as many people had the ability to frequent the theater and Broadway flourished. The musicals of the roaring twenties borrowed from Vaudeville. They focused big star actors and actresses, big dance routines and popular songs. In 1927, Showboat premiered at the Ziegfeld Theater. This theater is still open today. Not too many plays in the 1930s could exceed 500 performances due to the Great Depression. However, the show did go on and one of the most successful Broadway shows was Anything Goes by Cole Porter. As Thousands Cheer opened in 1933 and it was the first musical with an African American star: Ethel Waters. The 1940s highlighted hits from Cole Porter, Irving Berlin, Rodgers and Hart, Weill and Gershwin, some with runs over 500 performances as the economy rebounded. Broadway changed dramatically at this time. These writers focused on tying together all aspects of musical theater. They created an interesting plot and songs that captivated the viewer's interest with dances that developed the characters. In short, the writing and quality of work improved; thus the 1940s are referred to as the Golden Age for Broadway. After the unbearable Great Depression the show Oklahoma (1943) became a hit with 2,212 performances. At the same time, many musicals addressed the rise of Nazism during World War II. One of the most successful shows on this topic was Lillian Hellman's Watch on the Rhine that opened in 1941. The shows of the 1950's – 1970's still make up the core of the Musical Theater Repertoire that exists today. These shows include: Guys and Dolls, Peter Pan, A Tree Grows in Brooklyn, The Boy Friend, My Fair Lady and the Music Man. The Boyfriend marked the British star, Julie Andrews' American debut. West Side Story (1957), which transported Romeo and Juliet to modern day New York City and converted the feuding Montague and Capulet families into opposing ethnic gangs, the Jets and the Sharks. The music of West Side Story was written by Leonard Bernstein and the lyrics were written by Stephen Sondheim. The musical Hair sparked the rock musicals of the 1970s including: Jesus Christ Superstar, Godspell, and The Rocky Horror Show. The 1980s were all about mega-musicals and pop-operas with cool special effects. Some of the most famous and iconic musicals include West Side Story (1957), The Fantasticks (1960), Hair (1967), A Chorus Line (1975), Les Misérables (1985), The Phantom of the Opera (1986), Rent (1994), The Producers (2001) and Wicked (2003). 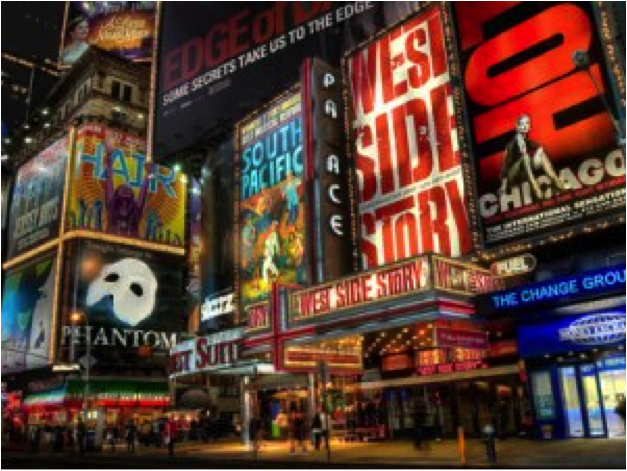 Broadway is an important industry to New York City; in 2012 ticket sales grossed $1 billion dollars with over 12 million attendees, according to the Broadway League. The Broadway District currently encompasses forty theaters from West 41st Street to West 53rd Street between Sixth and Ninth Avenue in Midtown of New York City. Only four of those theaters are actually located on Broadway. Broadway theaters are usually regarded as the highest quality of theater in the English-speaking world. For a performance to be considered Broadway it must be held in any of the 40 professional theaters that have 500 or more seats found in this area. The Antoinette Perry Award for Excellence in Theater, also known as the Tony Awards (or the Tonys), recognizes achievement in Broadway Live Theater. It is an annual ceremony that takes place in New York City and was named after Antoinette Perry herself. The award ceremony began in 1947 with eleven different categories. Today there are 26 categories from "Best Performance of a Leading Actress of a Musical" to "Best Costume of a Musical". The Tonys were originally held at the Waldorf Astoria in 1947 and now take place at the Radio City Music Hall. 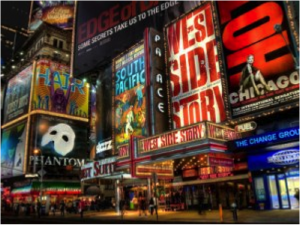 10 Must See Broadway Shows!